shot-maker Andrew Shipley, showing the current depth of young talent in the North East game. While such was the level of competition that men’s county players Paul Lord (retired injured in the quarters) and Chris Wiggins (a PSL player with Newcastle University) did not even make the last four. 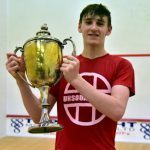 In the A Plate final, Newbiggin’s fast-improving Dave Jackson won a pulsating encounter against Tynemouth’s Jon Evans 3-1, while Max’s older brother Angus made it double joy in the Forster household with a hard-fought 3-1 win over Nathan Dobson in the B event final. Sunderland’s sharp-shooting duo of Peter McLeod and Simon Cliff retained their Doubles titles, while special mention must go to Jon Evans. As well as the A Plate runner-up trophy, the evergreen Evans also collected the Men’s Over 55 and Over 60 titles, beating Glenn Ward (3-0) and Ronnie Freeman (3-1) respectively. That feat took the 60-year-old through three gut-wrenching finals in one afternoon, at an age when he could be collecting his bus pass. Sam hits it for six. 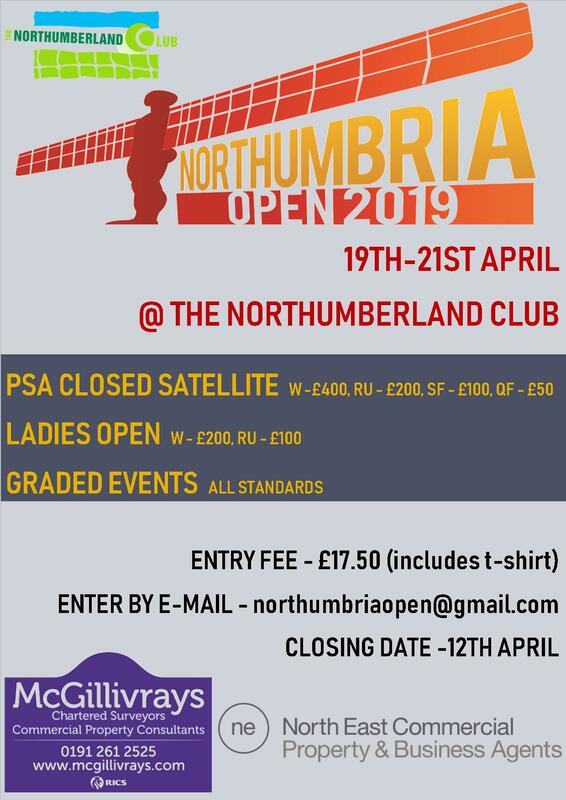 Northern’s Sam Ward tightened her grip on the Northumbria Ladies County Championship trophy – with a display which hinted at the building of a dynasty. Ward made it a magnificent six county titles – three in a row – in this annual New Year tournament at Tynemouth – and did so this time around without dropping a game. 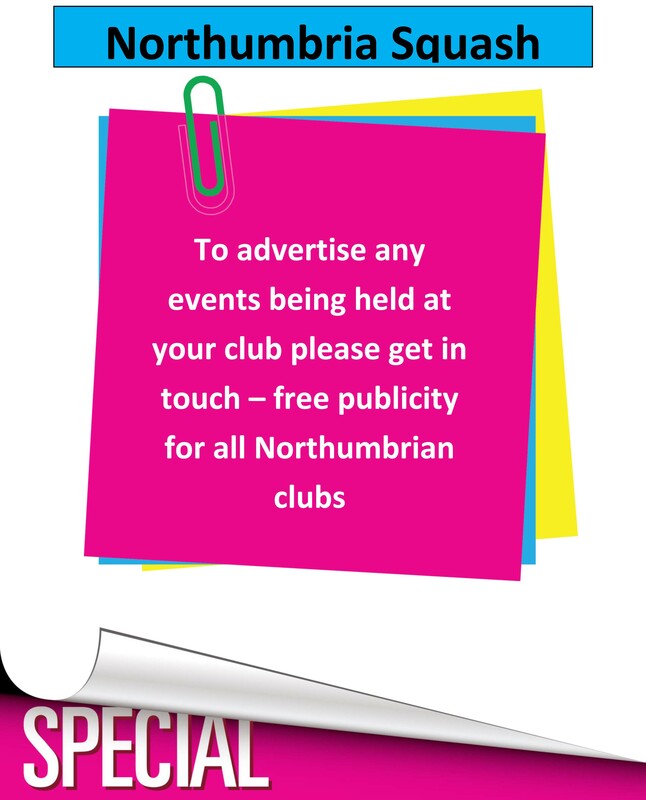 The 25-year-old has been in top form this season – mixing it with some of the best male players in the region by playing for her club at No 3 in the Northumberland Premier League. And she had too much for Tynemouth’s Amy Rowell in the semi-final, taking it 3-0 with some superb volley kills. 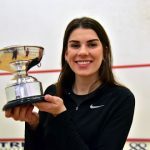 The final, in front of a packed glass-back crowd at Tynemouth, pitched the hard-hitting Ward against an experienced shot-maker in Emma Gregson (née Barnett, and sister of men’s finalist Dave). Gregson has a full array of attacking shots in her locker, and knows how to find the nicks and how to mix it up when she needs to. Ward, though, was able to up the pace at will, and that proved crucial as she clinched the title in some style. Always hunting the volley, she maintained her customary focus to close the match out 3-0 – 11-5, 11-5, 11-5.